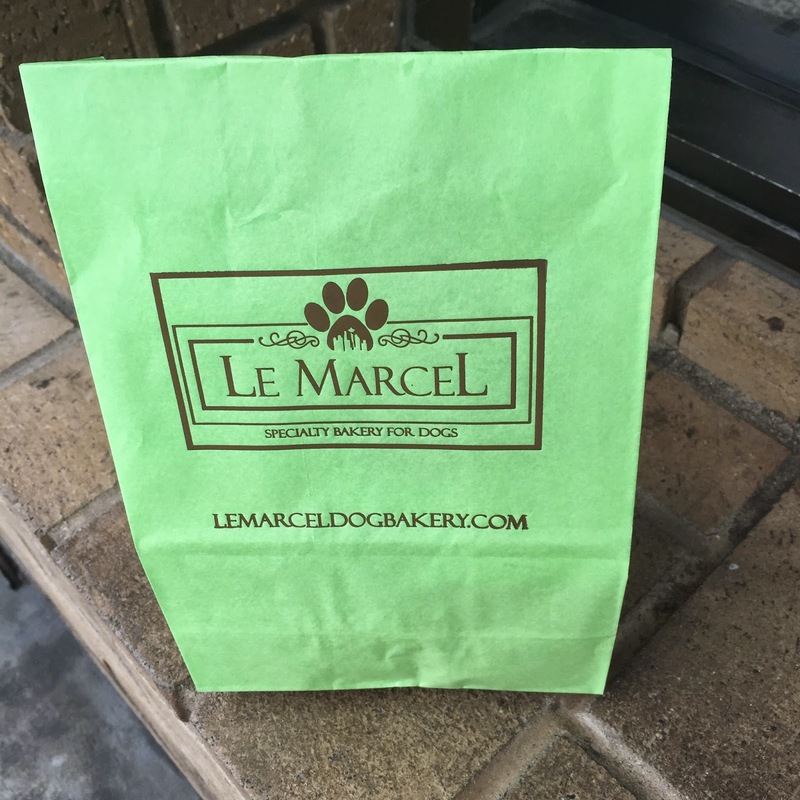 Today mommy was walking home from an appointment on Union Street and discovered a very special place: Le Marcel Specialty Bakery for Dogs. She can't walk past any store that has anything to do with pups. She had to stop and go inside. She was hopeful that she might find a new place to buy us a treat. She walked up the steps and found a very fancy bakery inside. There was a lovely big counter, shiny professional ovens, a nice big ‘prep’ area and lots of extraordinary pastries, cakes and cookies of all shapes and sizes in glass cases. 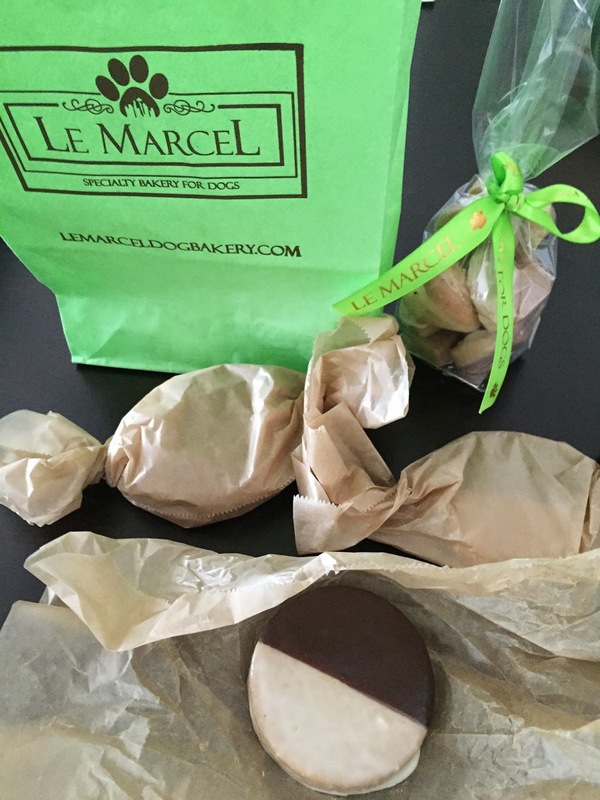 And more cookies on displays on the counter in lovely wrapped packages. It was so amazing that she needed to double-check that she was, in fact, in a "dog" bakery. It was. And it was beautiful. As she gazed at all the remarkably delicious-looking goodies, she smiled because she knew she was in trouble. We were extra happen when she came home. She walked to the dining table, carefully opened the pretty green bag and gently removed the fancy wrapped goodies from inside to show daddy. We like it when mommy takes walks. Always remember: Walking is great exercise! Get out and walk everyday. Mommy was rather disgusted by this habit, but she was also concerned that something serious could be wrong. Could I have something up in my nose that didn’t belong (like a pea in a human kid’s nose)? She started to research my symptoms online and didn’t like what she found. So I went in to see Dr Rob and he suggested a specialist do a procedure to see what was happening in my nasal cavity via a tiny scope. Mommy and daddy were very scared, but agreed to the procedure. I went in, went under, and was scoped. And at the same time, Dr Rob did a quick cosmetic procedure to remove a little ‘beauty mark’ from my muzzle. The results of the scoping: Nothing. All clear. Mommy and daddy were relieved it wasn’t serious. But the mystery continues. And unfortunately, so do the 'rockets'. Always Remember: We all have annoying habits. Sometimes you just gotta accept them. Today momma told daddy that she has decided that it’s time for her to get a Mac. So she went down to Chestnut Street and a couple hours later this is what she brought home. We don't know what a Mac is, but it definitely doesn't look like a Book. It looks like a white box to us. Always remember: It’s what’s on the inside that really matters. ...A couple hours later, here comes the leader for the free world driving by. We love this view. Always remember: Keep your eyes open and pay attention to your surroundings – you never know who you might see. As Northern California pups, we've never been in snow. Never seen it, never played in it and never had to go potty in it. 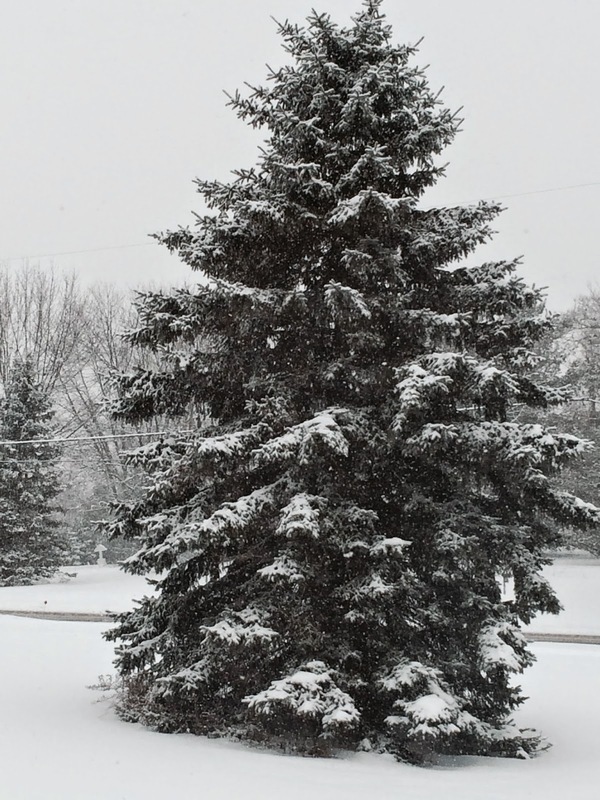 Momma called us today to tell us that it was snowing at Grandma's house in Ohio. And she sent us these pictures. 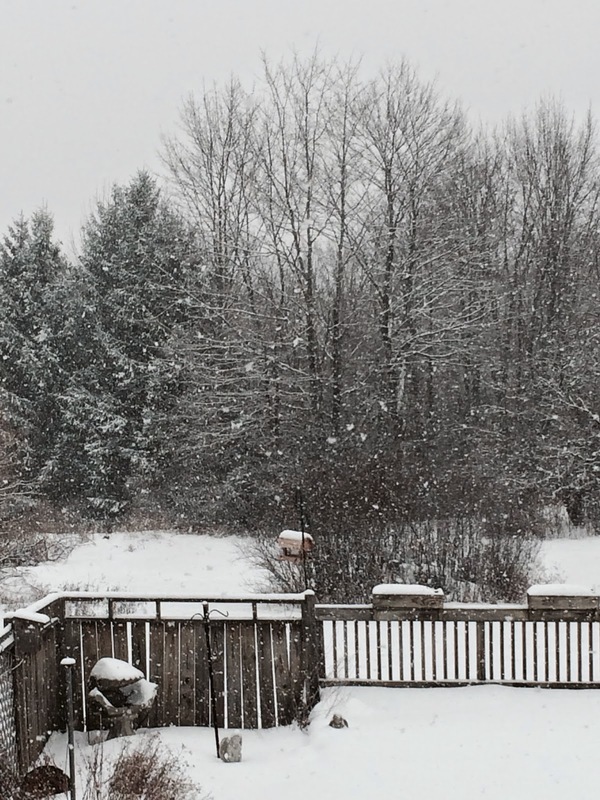 Daddy tried explaining to us that when it get's really, really, really cold instead of rain, snow falls from the sky and it covers the ground with a blanket of white. We asked daddy: If you put water in the freezer you get ice. Why when it get's cold outside doesn't the rain turn to ice? He answered: That a great question! You should look it up on the internet. Always remember: Don't be afraid to ask questions. You might learn something new and exciting! I (Rocco) do not like when the suitcase comes out because I know that means someone is leaving and my separation anxiety starts to take over. No matter how much momma and daddy try to comfort me and tell me it's ok or that I'm going too, I'm afraid I'll be left behind or they won't come back. I (Brownie) will miss her too. Once I notice she's gone. Always remember: It's ok to be scared, but don't let your fear get the best of you. The bed in the other bedroom is really high. And when our cousins come to visit we like to hang out with them. And when mommy works in there on here WFH days, we like to be in there with her. We are her ‘assistants’ after all. But without steps, we both need help getting up on the bed. And getting down is really scary. I (Rocco) can jump, but everyone is afraid I might hurt myself. And being afraid of heights, I (Brownie) would be stuck up there for days without help getting down (Brownie). 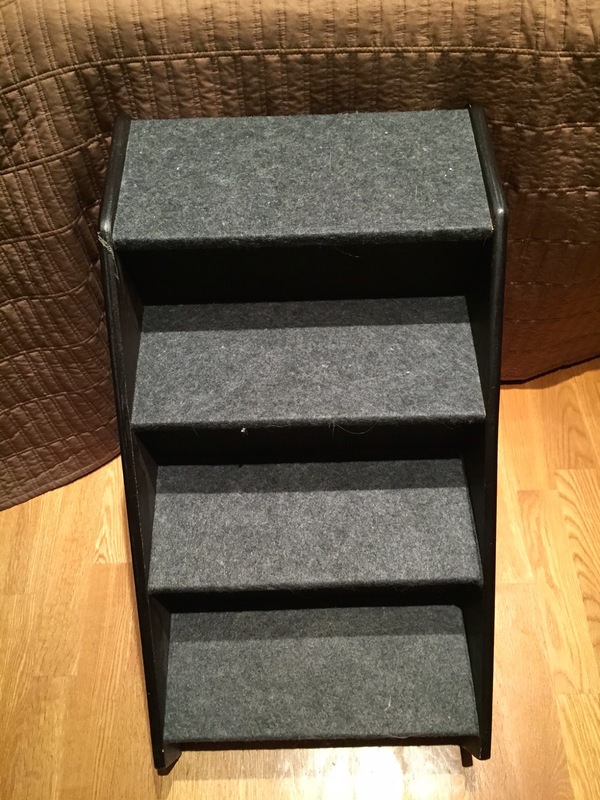 Come on, we’re little dogs and we’re 11 ½.
Daddy is tired of carrying our steps from one room to the other (and mommy cringles with every nick of a wall as he does), so today they came home with new steps for us. They are a bit steeper and a little strange, but we are learning to go up and down. Always remember: Don't be afraid to take the first step to try something new…you just might have fun in the process! 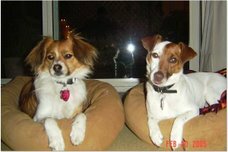 Rocco & Brownie Atterbury have lived in the City by the Bay, San Francisco, with our mommy and daddy full time for seven years now. We can't remember our country home in Solano, nor our big backyard, nor the cows on the surrounding hills... Although mommy likes to tell us stories about when we were country pups. We've adapted quite nicely to our city life. We love our big window overlooking the hustle & bustle & cablecars on California Street. Always remember: home is where your heart is. And ours are in San Francisco. Hi. My name is Brownie. 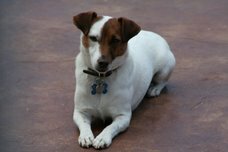 I’m a Jack Russell Terrier 100%. I’m very friendly when meeting people. But I really don't like other dogs. Professionals refer to me as a 'reactive dog' and that can be problematic in San Francisco. Also, when out, I pull, sniff and constantly search for something to gobble up. I listen when mommy says 'drop it'. But I'm daddy's boss, so he needs to listen to me. My all-time favorite thing to do is play fetch with my prize possession my 'vintage' brown Chewy Vuitton purse. HOLA, BONJOUR, CIAO. I am ROCCO. 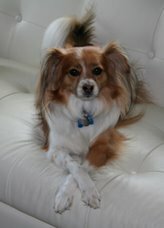 I am a smart and TALL Papillon. Humans remarks about my beauty. But they assume I am a girl dog because I am so pretty. C’est la vie. I am, who I am. And I am fancy. I don't walk, I prance. I would never ever eat something off of the sidewalk. I don't like getting dirty so walks on the beach our out. As are muddy, busy dog park. Although I am easily bored with fetch, I do enjoy tug-of-war on occasion and stealing any toy that has Brownie's attention. My very favorite person in the whole wide world is my momma. I follow her around…well, like a puppy. Daddy adopted us from two different garages in Fairfield on Halloween 2003. We quickly got used to each other and now we are inseparable. He was a good daddy back then, except he would always put us in our crates when he left the house and at night. It was boring, lonely and a little cramped. Then he met mommy & fell in love. At first she unsure of life with dogs. But we quickly melted her heart. Really, how could she resist? Soon she convinced daddy to leave us out of our cages more and more. Now we don’t even use the crates. The best part is curling up on their bed at night. Our birthdays are four days apart. I’m (Rocco) older; I was born on August 12, 2003 and Brownie was born on August 16 that same year. Birthdays are special occassions in our house. 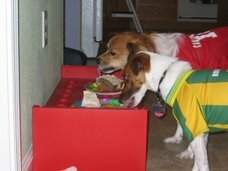 For example, on our second birthday we got dressed up in our favorite sports jerseys and had a party. It was an Elmo theme complete with plates, napkins and hats. We got lots of cool presents and mommy baked us a very yummy birthday cake. The content on this website is the intellectual property of our momma, Linette Zanona Atterbury. To contact her or us, email her at lzanona@yahoo.com.